We’d love your help. 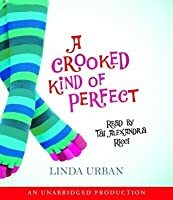 Let us know what’s wrong with this preview of A Crooked Kind of Perfect by Linda Urban. Ten-year-old Zoe Elias has perfect piano dreams. She can practically feel the keys under her flying fingers; she can hear the audience's applause. All she needs is a baby grand so she can start her lessons, and then she'll be well on her way to Carnegie Hall. But when Dad ventures to the music store and ends up with a wheezy organ instead of a piano, Zoe's dreams hit a sour Ten-year-old Zoe Elias has perfect piano dreams. She can practically feel the keys under her flying fingers; she can hear the audience's applause. All she needs is a baby grand so she can start her lessons, and then she'll be well on her way to Carnegie Hall. But when Dad ventures to the music store and ends up with a wheezy organ instead of a piano, Zoe's dreams hit a sour note. Learning the organ versions of old TV theme songs just isn't the same as mastering Beethoven on the piano. And the organ isn't the only part of Zoe's life in Michigan that's off-kilter, what with Mom constantly at work, Dad afraid to leave the house, and that odd boy, Wheeler Diggs, following her home from school every day. To ask other readers questions about A Crooked Kind of Perfect, please sign up. Brooke Not currently, but the author has not come out and said so directly. Humor is just so hard in children's books. You either crash too hard on the adult side of the equation (see: The Manny Files) or you end up going too far the other direction and end up ridiculously scatological (see: Out of Patience). The balance has to be perfect and, if you want your book to be memorable, also work in some real emotion, heart, and (God help us all) learning. Because this mix is so difficult, you rarely end up with a book quite as pleasant as Linda Urban's "A Crooked Kind of Pe Humor is just so hard in children's books. You either crash too hard on the adult side of the equation (see: The Manny Files) or you end up going too far the other direction and end up ridiculously scatological (see: Out of Patience). The balance has to be perfect and, if you want your book to be memorable, also work in some real emotion, heart, and (God help us all) learning. Because this mix is so difficult, you rarely end up with a book quite as pleasant as Linda Urban's "A Crooked Kind of Perfect". First of all, it wins the 2007 Most Appropriate Title Award. Second, it has a firm grasp on hitting just the right tone. In a relatively blah year of realistic girl fiction, Urban's book is a cut above the rest. Zoe has dreams you know. Dreams of owning a gorgeous piano, all shiny and black. Of performing before vast adoring audiences. Of being a prodigy and admired by people like her classically inclined mother. So what does she get instead? An organ. A Perfectone D-60 if you want to be precise. And it's not as if her school life is much of an improvement either. Her former best friend Emma Dent has informed her that Joella Tinstella is now her best friend right now, and to top it all off that bully Wheeler Diggs has somehow managed to ingratiate himself into her family. So when Zoe enters the Perform-O-Rama competition for organs she doesn't expect much. Fortunately for her, she finds that people can surprise you when you least expect them to. Sometimes for the bad, but also sometimes for the good. Correct me if I'm wrong, but I'm fairly certain that we haven't come up with a name for children's novels with short short chapters. You know the kind I mean. They look like verse novels at first, but a quick perusal shows that the author hasn't broken up the action into strategically separated tiny sentences. I think the author chose this method because she prefers to keep things sharp and sweet. Her storyline works best when she can leap from thought to memory to current event. Some parents like to pooh-pooh those children's books that eschew length for sure-footed pacing. I'll admit right here and now that due to its format "A Crooked Kind of Perfect" really does make for an enjoyably quick book. You might want to consider handing it to those kids who like to read but are turned off by long wordy novels. If the book has a problem it probably concerns the lack of dramatic tension. For example, one day Wheeler's mildly pissed about something and yet the next time Zoe sees him she says, "I thought you might not come back here ever." It's a rather extreme sentence considering the two of them never ever really fight. There is some tension regarding Zoe's parents and their presence in her life, so that may make up for the lack of problems elsewhere in the book. Yet as a former resident of Southwestern Michigan, I'd have enjoyed a little more clarification as to the location of this book. The competition is in somewhere called Birch Valley? Aw, make it Kalamazoo. You could totally have a competition there. Recommended to Marjorie by: saw it in the library, liked the cover! I adored this book. Hilarious, sad, suspenseful, and definitely quirky-odd-good. Loved Zoe's resilience. She gets dumped by her best friend and is invited (by former friend's mom, who doesn't know of the dumpage, in the way that moms of 11-year-olds always know nothing) to former friend's party, where she is dressed wrong and brings the wrong gift. Ack! Who hasn't been there?? The portrayal of hyper-sophisticated, dismissive, clique-y, Bratz-wearing (called Brat here, mistakenly but amusingly ca I adored this book. Hilarious, sad, suspenseful, and definitely quirky-odd-good. Loved Zoe's resilience. She gets dumped by her best friend and is invited (by former friend's mom, who doesn't know of the dumpage, in the way that moms of 11-year-olds always know nothing) to former friend's party, where she is dressed wrong and brings the wrong gift. Ack! Who hasn't been there?? The portrayal of hyper-sophisticated, dismissive, clique-y, Bratz-wearing (called Brat here, mistakenly but amusingly called Snot by another character) is dead-on. I love that Zoe is true to her own geeky passions in the face of all kinds of challenges and rejection. One parent is clearly mentally ill; the other is a workaholic (but doesn't she have to be, since she's married to someone who can barely leave the house? The book's kind to their flaws, but still draws them sharply). Zoe wants to be the next Vladimir Horowitz, but gets saddled with the Perfectone-60 cheeseball organ instead of a grand piano, and has to learn 70s TV theme songs and Neil Diamond numbers instead of Bach. Loved the portrayal of the Perfect-O-Rama competitive organ scene, where one Perfect-O-Rama Mama snarks that at a kid's playing of "Gettin' Jiggy Wit' It" as insufficiently jiggy. On the organ, people!! For me the only mild flaw was that the cool boy is too perfect. If I were in fourth grade, this would SO not be a flaw. I originally picked up this book because of the cover. It may be obvious by my profile picture, but I LOVE striped socks. I honestly had no idea what this book was about. Just the fact that it's middle grade. Turns out, this book is about Zoe. A ten (almost eleven) year old who wants to play the piano and dreams of playing at Carnegie Hall. But her Dad accidentally picks up a old organ instead. What I liked about this book was how authentic it was. This book was from a ten-year-old perspective and the voice was so much like a ten-year-old. Zoe is so focused on problems that only a ten-year-old would worry about. Like how nobody wears socks anymore (People definitely wear socks, Zoe. I can atest to that). And the overall life of a ten-year-old. Old friends leaving in a blink of an eye, making new friends, and her family. The characters were great! I really liked Zoe's Dad! He was very odd, but he was really amazing! Zoe's mom is a workaholic and never seems to have time for Zoe, but she means well. Wheeler is an odd boy at school who turns out to be Zoe's friend and I think that was great, too. Overall, this was a really cute read and left me with a good feeling. It's really short, only 200-something pages, with really short chapters. I think this is a great book to get you in a good mood! Sometimes authors write 5 star books, and sometimes authors are 5 star writers. Linda Urban is a 5 star writer. This was just plain perfect! In this little gem of a book, Zoe yearns to play the piano. She is sure that the minute her teacher hears her, she will be declared a prodigy and find herself on stage at Carnegie Hall. But Zoe has problems: her mom is a workaholic, her dad is an agoraphobic, her best friend doesn't want to be friends any more, and the school bully is hanging around her house baking cookies with her dad. To cap it off, when her dad ventures out to buy her a piano, he panics and instea This was just plain perfect! In this little gem of a book, Zoe yearns to play the piano. She is sure that the minute her teacher hears her, she will be declared a prodigy and find herself on stage at Carnegie Hall. But Zoe has problems: her mom is a workaholic, her dad is an agoraphobic, her best friend doesn't want to be friends any more, and the school bully is hanging around her house baking cookies with her dad. To cap it off, when her dad ventures out to buy her a piano, he panics and instead buys her an electric organ, complete with lessons. Eat a lot of cookies, for one thing (they sounded so good)! Take the organ lessons and do her best at them. I think this book was good but I like these kinds of books so that's probably why I give them good reviews. This book is about a girl named Zoe who sooooooo desperately wants to get a piano and be a professional. But instead she gets a wheezy organ. Her friend kind of breaks up there friendship so she ends up with the boys. This is a fantastic book for upper elementary and middle school kids who aren't ready to make that leap into high school issues and angst. It's a sweet, honest, funny story about a girl with grand piano dreams and a wheezy organ reality. This book makes music. It left me smiling, and humming along. This was a quick, easy read. The main character, Zoe Elias, is adorable. She's only in 5th grade but she has it in her heart that she wants to be a child prodigy pianist. Problem is, she has no piano. So when she asks her parents to buy her one, her father goes out and gets her something to learn on but it's not a piano. Instead, her father gets her a Perfectone D-60. She's not all that happy with it, but it's something. She ends up taking lessons but her lessons include a folded up keyboard so This was a quick, easy read. The main character, Zoe Elias, is adorable. She's only in 5th grade but she has it in her heart that she wants to be a child prodigy pianist. Problem is, she has no piano. So when she asks her parents to buy her one, her father goes out and gets her something to learn on but it's not a piano. Instead, her father gets her a Perfectone D-60. She's not all that happy with it, but it's something. She ends up taking lessons but her lessons include a folded up keyboard so that when she practices and "plays," no sound is coming out. A bit odd if you ask me. She learns from Lester Rennet of "More for Les" program. Zoe is going to do a competition (only 7 weeks away) that her teacher puts her in. When she learns from a boy that he practices a minimum of 4 hours a day, she decides she needs to do that too. But she wants to do a "recital" with a piano, not the type of playing contest she's going to participate in. Other characters are Mabelline Person, someone who helps her with her keyboarding and "tests" Zoe's skills. Sadly, she's not a prodigy. Wheeler Diggs is a boy who is a thorn in her side, but she likes him for some odd reason kind of like a boyfriend. Her father is opposite her mother. Her dad is a University of the Living Room student who's earned a lot of degrees; her mother is a controller and sees over money. Her dad is more carefree, while her mother is stiff. ***SPOILER ALERT*** Have you ever wished for something and got the completely opposite of what you actually wanted? According to what I have read the genre is realistic fiction. Its realistic fiction because most of this story can actually happen. I like this book because its funny, and also sad. This book is about a young girl named Zoe. A ten year old going on to eleven years who dreams of playing the piano and wishes playing at Carnegie Hall. But her dad mistakenly picks up an old organ inste ***SPOILER ALERT*** Have you ever wished for something and got the completely opposite of what you actually wanted? According to what I have read the genre is realistic fiction. Its realistic fiction because most of this story can actually happen. I like this book because its funny, and also sad. This book is about a young girl named Zoe. A ten year old going on to eleven years who dreams of playing the piano and wishes playing at Carnegie Hall. But her dad mistakenly picks up an old organ instead.Zoe's dreams are ruined,her new tutor makes her play old television theme songs and wishes to play Mozart. Not only her dreams are ruined but her dad is afraid to leave her home alone while her mom is always at work.Also Zoe becomes very close with the class bully (wheeler) and spends almost all the time at Zoe's. Zoe joins an organ competition and Zoe's dad over comes his fears and takes her to the competition. Zoe ends up doing an awesome job, meeting a new friend and her mom actually makes it in time to watch her perform. The point of view is first person. First person because the narrator used words such as "I", "me" and other words that talk about themselves. The point of view affects the story because it lets me know how the character feels towards others or herself.It also kinda makes me feel like I am in the story and I can also relate to some of the things the character is facing. For in example in the story it said that Zoe's dad fears on leaving her alone while her mom is working and I can relate to that.The title relates to the story because it helps the reader kinda understand how Zoe's life did not turn out how she wanted it to be but at the end she realizes that everything has flipped around and is actually going the right direction. The authors tone is frustrated in the beginning and relieved at the end. I say frustrated because things were not going as wished and at the end everything is way better.The major symbol in this story is to never lose hope and keep your head up because at the end some things she hoped for actually happened. In my opinion I was surprised when Zoe became friends with a bully because of how easily they got along. I liked how the author started the the story going bad and unplanned at at the end it got better. My favorite part is when Zoe's mom showed up because that is what Zoe was worried about,that she would not show up.I thought the ending of the book was good because Zoe ended up getting a piano. "A crooked kind of perfect" is a good title for the book because it kinda explains Zoe's life because nothing went as planned and at the end they did because her dad faced his fear, her mom showed up for her performance and she also got a piano. You could describe this book as: "It's about a girl who plays the organ but really wants to play the piano." But . . . then you would be missing the vulnerability, the complexity of family, the power of people in your corner and the pure brilliance Linda Urban has with words on a page. This was a cute, quick read about a resilient girl who realizes that even though you may not be achieving your dreams, you might be achieving something better. I enjoyed Zoe's never-give-up attitude and those who supported her every step of the way. The descriptive details made me feel like I was a part of the story through every step of Zoe's journey in her world that was a crooked kind of perfect. Even though I don't play an instrument, I still felt the amazing effect playing had on Zoe, which This was a cute, quick read about a resilient girl who realizes that even though you may not be achieving your dreams, you might be achieving something better. Even though I don't play an instrument, I still felt the amazing effect playing had on Zoe, which made for an entertaining read. Due to all the positive reviews and fantastic cover, I actually had rather high hopes for this book. Unfortunately, A Crooked Kind Of Perfect didn't really meet them. Don't get me wrong; It wasn't BAD. It just wasn't great for a number of reasons. For one thing, if I had never read the blurb on the back, I wouldn't have found out the protagonist's name was Zoe until about halfway though the story. I do know it's a first person POV, but SOMEONE should've mentioned her name by then. I do understand that the author was trying to be creative and original with Zoe's voice too, but the writing was so awful and dreadful that it was a miracle I finished this in one day (I am a very fast reader and this book was very thin, but still). The other characters were even more flat and bland than Zoe was. Wesley...? Wes...? Fabulous. The character was so boring and uninteresting that I think I forgot his name entirely! Anyways, there wasn't all that much to him either. So, yes. All I have to say is that I wouldn't really recommend A Crooked Kind Of Perfect and that I only give it two stars. Linda Urban has the soul of a poet. This is her first book, and its title exemplifies what I loved about it and her other novel, Hound Dog True; for me, this book also built upon and clarified that love. Urban celebrates that crooked kind of perfect that makes up the most beautiful people and moments in our lives. What about this book? (You may ask.) What happens in it? Well, this book is about Zoe Elias, a 5th grade girl who wants to play piano. It is about her pursuit of that dream, the obstacles Linda Urban has the soul of a poet. Well, this book is about Zoe Elias, a 5th grade girl who wants to play piano. It is about her pursuit of that dream, the obstacles to that pursuit (I'm not an instant prodigy?) and the folks around her who do or do not help her along the way. It is about overcoming fears - especially fears about imperfection - and appreciating the wonder in front of us. It is just good. Beautiful. It will feed your soul, especially if you suspect that you, too, might have the soul of a poet. Give me a narrator that rubs me the wrong way, and I will give you a book that just won't resonate with me. Tai Ricci, the narrator on the audiobook version of A Crooked Kind of Perfect, delivers the voice of Zoe in a clipped, rhythmic manner that makes the repetition in the prose nearly unbearable. Perhaps Zoe isn't meant to be obnoxious and pretentious, but Ricci sure makes her seem that way. I did appreciate Urban's attempts to address several issues: tween crushes, agoraphobia, absent parents Give me a narrator that rubs me the wrong way, and I will give you a book that just won't resonate with me. Tai Ricci, the narrator on the audiobook version of A Crooked Kind of Perfect, delivers the voice of Zoe in a clipped, rhythmic manner that makes the repetition in the prose nearly unbearable. Perhaps Zoe isn't meant to be obnoxious and pretentious, but Ricci sure makes her seem that way. I did appreciate Urban's attempts to address several issues: tween crushes, agoraphobia, absent parents, social cliques, etc. I found the retro-pop culture references to be a bit grating. How many tweens are into Neil Diamond and Zsa Zsa Gabore? I am sure that many are aware of them, but are they interested enough in these outdated references to find them amusing? It's sweet, endearing, & silly--that's why my 10-year-old daughter loves this book so much and has read it more times than I can count. It's very tender at the end (even I was crying when Zoe realized that the mom was happy about Zoe, not work) and I loved seeing everyone find happiness at the end. I wish I could give this book 6 stars! I wasn't prepared for this level of depth from what looks to be a cute middle grade. But it's so much more than that. With its word play and humor, you could easily overlook the fact that it's dealing with phobias and mental illness in the most brilliant and accessible way possible. MORE STARS! Linda Urban has a knack for making us see the wonder in small things. I loved Zoe's story and her humor asshe learns to play the organ and cope with her parents. Just reread this cute book. I think I loved it even more the second time! This review has been hidden because it contains spoilers. To view it, click here. 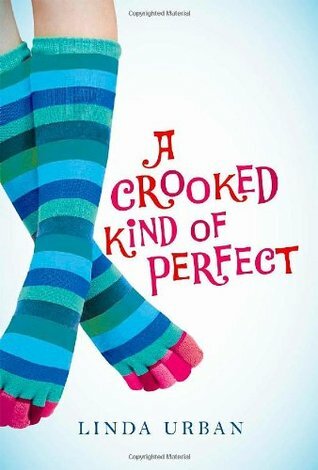 How can a book with a title like "A Crooked Kind of Perfect" NOT be good? But it wasn't just good--it was lovely. I have not enjoyed reading a book so much since The Westing Game. I laughed a lot in this story. It is believable enough to be relatable but unbelievable enough to be entertaining and somewhat whimsical. The characters are fantastic. I loved all of them, even Emily Denton just because I think all of us can think of someone from our childhood who reminds us of her with her Brat shoes How can a book with a title like "A Crooked Kind of Perfect" NOT be good? But it wasn't just good--it was lovely. I have not enjoyed reading a book so much since The Westing Game. I laughed a lot in this story. It is believable enough to be relatable but unbelievable enough to be entertaining and somewhat whimsical. The characters are fantastic. I loved all of them, even Emily Denton just because I think all of us can think of someone from our childhood who reminds us of her with her Brat shoes and flirtiness. * The names of the stores, the brands, etc. They all sounded completely real. Bust-a-Burger, Living Room University, Molasses Chums and all the other names for those cookies... they must have been fun to make up. * All of Miss Person's and Zoe's expletives: Wagner's Aunt Alice, Beethoven's lunch lady, Mozart's postman, Chopin's toaster, and (my personal favorite) Sweet brother of Bach. * Symbolism: Socks are cozy. The Perfectone D-60 is cozy. They represent the things that Zoe gets self-conscious about but that she enjoys. What are some things we might get self-conscious about because of how other people look at them, but we enjoy them? * The ending lines: "I don't care if my piano isn't perfect yet. I just want to play. And I do." So life isn't perfect. So you're not perfect. Keep living anyway. Crookedness, in a way, is its own kind of perfect. The author got this point across in a way that I think kids would be able to understand, but she didn't bang it over your head a thousand times as some authors will do. There is something else I need to include although it has nothing to do with any copy of the book you will read because this part of the story is only in the copy I own. I found "A Crooked Kind of Perfect" on the sale shelf at the library I work at. It was only $1.00. Or maybe it was $0.50. It was in perfect condition. So I bought it. I noticed that on the title page there was a black stamp that read: "Donated in Loving Memory of Katrina Lawrence." I didn't look her up immediately, but then I got curious. I expected Katrina Lawrence to be an elderly lady who loved books while she was alive. Instead, she was a 36-year-old who had six kids. She died due to complications while having her sixth child. The baby lived but she didn't. If it is the same Katrina Lawrence, I am glad to have a book that was donated in memory of her. It's interesting how getting a second-hand book can have two stories inside it. The one typed out that everyone gets to read and the one hidden behind a stamp. My 10 yr old son and I read this together for a school competition. It's short and quick. In his words: "This is my favorite one so far. I liked that I could relate to the story and the ending wasn't cheesy." I think my son could relate to the main character's (Zoe) struggle to learn to play a new instrument (he plays piano). Zoe is cute. I like her authentic voice and what she observes about people and their behavior. I like that it's a story about finding friendship in unexpected places, trying My 10 yr old son and I read this together for a school competition. It's short and quick. In his words: "This is my favorite one so far. I liked that I could relate to the story and the ending wasn't cheesy." I think my son could relate to the main character's (Zoe) struggle to learn to play a new instrument (he plays piano). Zoe is cute. I like her authentic voice and what she observes about people and their behavior. I like that it's a story about finding friendship in unexpected places, trying something new and adapting to the ups and downs of life. This is another book I read for the BOB competition. It's a sweet story about a ten year old who has dreams of playing the piano, but whose dad buys an organ instead. She makes the most of her organ lessons, while also dealing with her dad's agrophobia, her mom's overworking and thus not being home much, and issues with old friends and new friends. I'm sure my 6th grader is going to really like this one. This was a nice little book about Zoe, who wants a piano, dreaming of Carnegie Hall, and gets an organ from her eccentric father. There’s a great friendship with Wheeler, and a quirky organ teacher who recognizes talent in Zoe’s organ playing. This is a very cute book! I enjoyed reading the book “A Crooked Kind of Perfect” by Linda Urban. This book was sad in places. I remember being that age and not always fitting in. Emma lives in a small house with an abnormal family. They do not have much money. Her mom works a lot. Her dad has anxiety problems. He does like to bake. Zoe does get an organ and months of organ lessons. She chooses a song by Neil Diamond called “Forever in Blue Jeans”. Wheeler Digs is a boy she knows who follows her home from school. She shar I enjoyed reading the book “A Crooked Kind of Perfect” by Linda Urban. This book was sad in places. I remember being that age and not always fitting in. Emma lives in a small house with an abnormal family. They do not have much money. Her mom works a lot. Her dad has anxiety problems. He does like to bake. Zoe does get an organ and months of organ lessons. She chooses a song by Neil Diamond called “Forever in Blue Jeans”. Wheeler Digs is a boy she knows who follows her home from school. She shared some cookies with him and now he gets off the bus and just follows her home. He comes in her home and eats cookies at her table and talks with her dad. He starts hanging out at Zoe’s home and even has her father help him with his homework. The main character in the book is Zoe Elias, but her friend, Wheeler Diggs calls her Zsa Zsa. Zoe had a best friend, named Emma, who was rich and lived in a big house. Emma eventually left Zoe aside for another “best Friend”. Emma has a mom and a dad. Her mom works all the time and makes all the money for the family. Her dad likes to bake and has problems with the outside world. He cannot leave the house due to anxiety problems. Zoe dreams of being a piano player at Carnegie Hall. Instead of a piano, she gets an organ. Zoe has a pretty difficult life. She is poor and does not have any friends. Her family life is odd. Mom works and dad can’t leave the house. Zoe decides to play in the Perform-O-Rama on her organ. She chooses a song by Neil Diamond called “Forever in Blue Jeans. The night of the performance, her mom has to work late. To her surprise, her dad takes her. It is a huge effort because it is an overnight trip. The book takes place in the present. Zoe is ten years old, and turns eleven in the story. She lives in a small, two bedroom home. They do not have much money and her father cannot leave the house. He is a great baker, but anxiety issues force him to stay home. Her mom is a controller for the state of Michigan. I believe there is a lesson in the story. Zoe learns to be thankful for what she has. During the story, she wishes for a normal family, a piano, a best friend, a boyfriend and not being poor. As the story progresses, she realizes she is lucky. Zoe has the love of her family. Seeing her parents happy made her happy. She does appreciate what she has. She does make new friends. I would recommend this book. It was a book with a great ending. It also made me appreciate my life and what I have. It made me appreciate the people in my life. “I told Dad about yesterday...I told him how I made all those mistakes. 'But you kept on playing?' Dad said. His eyes got wide when he said it. I could tell he was proud.